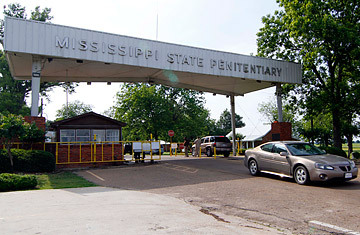 The Mississippi State Penitentiary in Parchman, Miss. on May 19, 2010. Will the Supreme Court Keep Prisons Overcrowded? Epps, who declines to identify his political affiliation  "the lord is our boss, regardless of what party he or she is in"  was a senior department official in 1995, when Mississippi's legislature caught the "truth-in-sentencing" wave sweeping the country. The legislature didn't just follow other states in requiring people convicted of violent crime to serve 85% of a sentence before becoming eligible for release. Mississippi went one step further. It required all offenders, regardless of conviction, to complete the bulk of their sentence. Previously, the state's inmates could receive parole after serving one-quarter of their sentence, and most served about half. So Mississippi ordered nearly 6,000 new prison beds, backed by billions in Clinton Administration funding for "truth-in-sentencing" policies intended to break the cycle of violence. Between 1997 and 1999, Mississippi opened seven prisons, some private. Impoverished Mississippi Delta towns that had watched their fortunes disappear with the cotton industry energetically courted the prospective business. Policymakers "felt their constituents, and taxpayers, wanted individuals who committed crimes to be locked up," recalls Willie Simmons, chair of the legislature's corrections committee and a critic of the prison boom. "They wanted us to be tough on crime." Soon, Epps recalls, Mississippi's prisons and jails became so overcrowded that local sheriffs allowed inmates to sleep in their offices, and forced them out in the morning. "That's how bad it was," Epps says. He recalls watching the Republican senator driving the prison legislation, and thinking: "Someone failed to tell him  but he failed to realize  that we have whole families in our criminal justice system." Seven of every 10 Mississippi inmates have a relative in prison. By 2008, Mississippi's prison population had more than doubled to 22,646, and the corrections budget had nearly tripled to $348 million. Mississippi had the second-highest incarceration rate in America and was on track to add 5,000 prison beds in the next decade. "I knew it was going to be a problem, that it was going to explode," Epps says, sitting in a conference room near the state's capitol, thumbing through a timeline of the spiraling costs. "We kept rolling along. But it was too late." The turning point came in 2008. By summer, the Great Recession was in full effect, and Mississippi, already one of the nation's poorest states, was ailing. Governor Barbour opened his second term unapologetically preaching austerity: "Our duty is to live within our means." Department heads typically plead for more money. But Epps, sensing the moment, told the legislature: "If we keep putting the nonviolent in prison, there won't be any room for the violent." The legislature moved to allow nonviolent offenders to become eligible for parole, and the following year made people convicted of selling certain controlled substances eligible for house arrest. "The rationale was: we still want to be tough on crime, but we had to get this budget down," he says. Now, Epps is pushing Mississippi toward several alternatives. The state is testing a global-positioning device that costs about $13 a day per convict to keep tabs on an individual  far less than the $41.74 cost to house and feed a prisoner. "We're still monitoring you, which is probably better than in some of my facilities," he says. Elderly and terminally ill inmates are being released to their families, or hospices, saving nearly $5 million. He expects the number of people placed on house arrest to increase  as soon as Mississippi's wireless commission, which he chairs, expands Internet access to rural areas. In the coming months, he will push legislation to expand inmates' eligibility for parole  potentially lowering the prison population by 19%, to 17,000, within two years. Projected savings: $52 million. "We can't spend enough on education," he says, "and that's a direct correlation to the number of people coming to me." Since 2008, Mississippi has trimmed its corrections budget by about 5%, to $332 million. Reducing the prison population hasn't caused the state's violent crime rate to rise. In fact, the rate is falling toward 1970s levels, and the state's recidivism rate has decreased to 30% in the last four years  well below the national average. Mississippi's effort is being closely followed by other states. Ohio's Senate, for instance, is considering a potentially sweeping overhaul of the state's corrections system. There is, of course, the risk that the inability of states to invest in rehabilitation programs for ex-offenders reentering a society that still bars them from jobs and housing will ultimately cause crime, and recidivism rates, to rise. Nevertheless, Epps believes his reforms will ultimately pay-off. "I'm proud to say we're moving Mississippi into the 21st century." See a brief history of prison riots.